So Halloween is fast approaching, one of my absolute favorite holidays. When all the good stuff is stocked in my local Dollar tree, The Walking dead premieres soon before and there are horror pictures galore on Facebook. Life is good right now and contoured to my liking. The best yet though, is this t-shirt I got to review from Bad Idea T-shirts The PR asked me if offensive bothered me and I said no, in the hopes that I would receive something more than average. I also mentioned that I loved zombies and wouldn't mind if they sent me one from that genre. Being that I had no choice in the matter, I was pretty worried about what would arrive. What I got though, was a very pleasant surprise. I got a zombie tee! Not only did I get one I wanted, but it's just awesome and low and behold, based on the show, The Walking Dead! Ahh, my favorite soap opera. Well, my only soap opera, interrupted by zombies. It was really a crap shoot of chance getting this particular tee. Being that there are a ton of zombie tees out there, I had no idea what i'd get. The design plays off the show superbly. 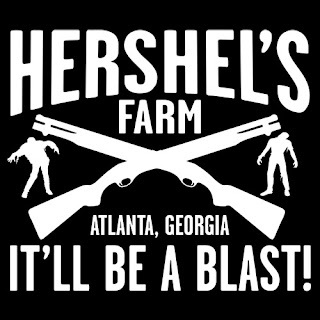 The play on words is in reference to Hershel, the owner of the farm that all the survivors fled to escape from the zombie onslaught. "It'll be a blast" indeed. Considering 80% of the movie is spent blasting un-dead heads. Don't you love cleverly designed shirts with a corn factor? It just reeks of 80's cult horror, doesn't it? I think this is so cheesy that it has to be loved. Heavy Weight, 100% cotton t-shirts. Shirts are made to order. You pick the design, style, color and size. My particular t-shirt's retail price is $17.99. The T-shirt was comfortable, but they also offer more comfortable brands, such as American Apparel. If these funny t-shirts aren't enough, they even have bottle cap opener t-shirts! I've never seen one of those, but that is definitely something unique that sets them apart from other retailers. To see more tees like this, go visit Bad Idea T-shirts and check out their FREE t-shirt giveaways on Facebook. Become a fan and you may just win one! That is awesome!1 I am a HUGE walking dead fan...I so need this shirt!1 Ty! I must own this shirt! They have a great variety. It would be really hard to choose one. hahaha I LOVE it!!!!!! Only thing that would offend me would be if it wasn't so badazz! I love their variety of shirts! I may have to buy a few. That shirt is awesome. I love funny tees. These are pretty neat, they'd make a nice gift! I Love this shirt, actually all i looked at were cool as well!